Is your Workforce Globally Competitive? Home » Featured » Is your Workforce Globally Competitive? With all the advancement in technology, it’s sometimes hard to keep up even if we already have the available resources at our disposal. We have instant access to knowledge using the internet, smart devices and even the assistance of Artificial Intelligence (AI). During this remarkable time, nothing is still more important than having the necessary tools to identify the core skills of your workforce within your organization and assess talents that will safeguard the future of your company with the incoming waves of change this 21st Century. We may just be a developing country but our workforce doesn’t need to be left behind. Other countries already started implementing their own 21st Century Skills framework to help their Education and Labor sectors gear up for the future. By having the right assessment tool to identify the skills and traits of your employees, you’ll be able to develop better program initiatives to train your onboarded talents and hire the right candidates for the future of work. What are you doing to make your employees’ skills better? Have you already devised a system to find out if they are able to meet the demands and challenges of the workplace? If you have no clue as to what is going to happen, you may want to start by testing how competent your employees are with simple but revealing assessments. Using the information that you gain from the assessments, regarding their strengths and weaknesses, your organization can come up with training programs to help them acquire or develop their skills further. It’s truly a brave new world but technology is not the only thing that matters. There are several skills that your team needs to have in order to make your organization globally competitive. You don’t have to go at it all at the same time. Start by measuring two to three skills and work your way up until the end of this list. The first step you can take is to have them take an assessment for you. Find out what their capabilities are and once you figure out what they are capable of, use the valuable insights that you have to plan a course of action on how to improve these skills. You can also deploy these assessments when hiring candidates which can make the decision process easier between shortlisted candidates. If you’re interested to make that first step now, Get In Touch with us so we can help your organization launch their first pilot assessment- without any costs. After completing the assessments for your workforce, you will finally be able to give a confident YES for an answer when someone asks you again if your workforce is as effective as their global counterparts. 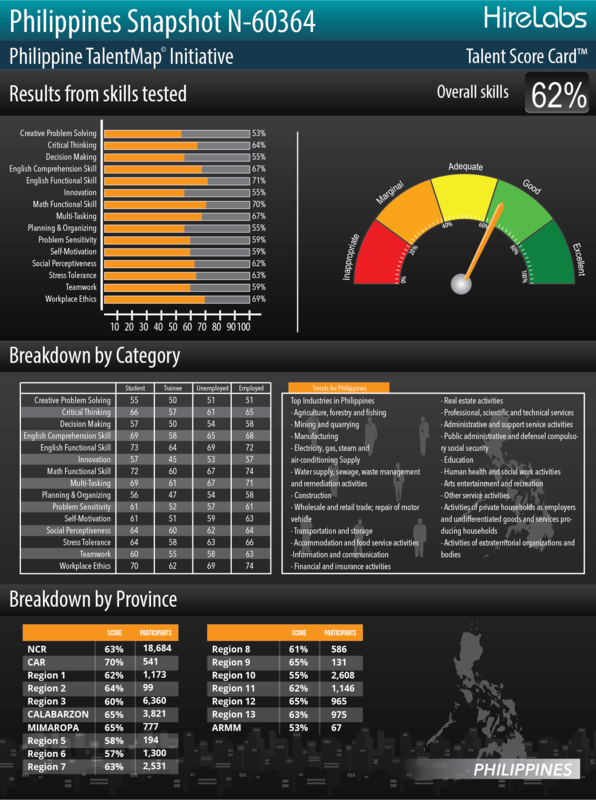 Below is a snapshot of the Talent Score Card summary derived from the assessments taken by Students, Jobseekers and Employees from all around the country with The Philippine TalentMap Initiative (PTMI). The PTMI is a customized 21st Century Skills assessment granted by TalentSource Inc., a subsidiary of Servicio Filipino Group of Companies, to the Department of Labor and Employment. For more information about the PTMI, please visit our homepage. Talent Growth Advocate | Chico is a Digital Marketing Professional who can connect professionals with technology and solutions that can help their organization grow. Talent Source is a platform dedicated specifically for companies and professionals. Is there a clear Winner between Paper-and-Pen vs Computer-based Tests?